In the course of our recent river clean-up opposite Brentside School, we experienced the full effects of FOG (fat, oil and grease) and understood something further about the role of dead vegetation in the river. Two sets of waders and a kayak were coated in a white, almost impossible-to-remove grease after being in the thick of it both near and in one case, in, a raft of assorted dead vegetation jammed up behind a fallen tree. The plastic litter we were after had accumulated on top of this raft and in order to access it, we had to break up the vegetation with rakes. This is when we released the hitherto-hidden FOG lurking there. So, the raft, which was between 2 foot and 5 foot in depth, was acting as a highly successful filter trap keeping the FOG in one manageable place. The question now is how the FOG should best be extracted from such a trap so that the vegetation can continue to act as a trap without getting entirely clogged up? Suggestions welcome! It also begs the question of how the FOG got into the river in the first place. Misconnections? The practice of pouring fat, oil and grease down the plughole in the kitchen sink, down the toilet and even directly into the river? How can we best educate/litigate to prevent these practices altogether? Again, all suggestions are welcome. One thing is sure: we need to stop FOG-tipping. Today the central meadow is being prepared for a seeding later in the day. After that the rain dance(s) will need to be performed to ensure a spectacular display in July. The Greenford to Gurnell Greenwayers had a fun day today, removing all sorts of rubbish from the River Brent. This included one large butane tank (at least 25 Kg), a modern rental bike which was lurking there and 53 bags of very smelly rubbish. This was a canoe job, dislodging items which had become trapped behind a fallen tree and for waders, who were downstream waiting to catch them. Others cleaned the banks. Photos of these heroes are below. 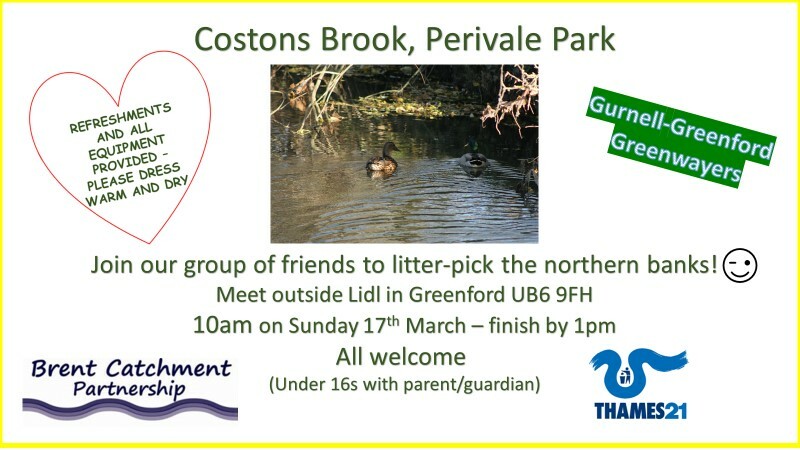 The next clean-up on the River Brent is taking place this Sunday 14th April starting at 1pm. This event is suitable for all because it will consist of river bank litter-picking as well as in-channel work in waders to clear a large litter-berg which has built up behind a fallen tree. So, gentle tasks as well as challenging ones – chacun à son goût. But please don’t take the ‘goût’ too far – the water isn’t drinkable! It is not just Perivale Park that is getting some attention. The Government has just announced the winners of a national competition called “Pocket Parks”. Costons Brook is one of two waterways in Perivale Park, being a tributary to the larger River Brent. It arises from perhaps three streams flowing from the north-west of the park, one apparently originating from the nearby Metropolitan business park. Tracing the others will require access to specialist maps! At any rate it flows out of a culvert near the children’s playground in the park, with an aspect that has recently become very much more accessible now that the blackthorn trees on each bank have been removed. Its been a wet and windy spring so far. Here are some photos of the entrance to Perivale Park near to the South Greenford station/ A40 entrance. Many new trees have been planted, or shortly will be planted in Perivale Park. Travelling in Morocco, we came across a very unusual species of tree and it struck me it would look really good to have one in the park. I think it would attract many new visitors! London now has a mild temperate climate, so the appearance of ice is relatively unusual. Here is the new pond in Perivale Park, nicely full from winter rains, with a thin covering of ice. Too thin of course for actual ice skating! Perivale Park is blessed with two rivers. To the south runs the river Brent and in the south-west its tributary Costons Brook. Today I learnt about two recent events involving cleaning up these waterways. Richard Spencer-Smith sent me the following descriptions of the activities of the Gurnell-Greenford Greenwayers. Station walks (relaunched) from South Greenford station. You can now plan your visit to Perivale Park by browsing the newly re-launched London National Park City station walks map. There are currently four walks starting from South Greenford (SG) station radiating out in the four compass directions. The Greenford-Gurnell Greenway starts to take shape. Over the last week, a short stretch of Coston’s brook as it runs through Perivale Park has been transformed. The brook rises in the industrial estates north of the A40 in west Greenford and for its short course it emerges from culverts and then openly runs through the park before joining the river Brent close to Greenford Bridge. For much of the last 30 years or so, its course through the park has been lined with impenetrable blackthorn. Although these produce delightful blossom in the spring, the blackthorn was effectively blocking access to the brook. Perivale Park bulb planting, October 27th, 2018. About 4500 bulbs‡ were planted in the north-west corner of the park yesterday. We were blessed with glorious sun, but rather foot-numbing temperatures. Despite this unanticipated coldness, we enjoyed delicious home-made lemonade provide by Jack, who also provided a fish&chip lunch for some of us. Botanic Gardens – 1452 to 1673. Perivale Park: the orchard project starts! One of the (several) projects under way in the park this autumn is the preparation of an orchard area, replacing the old bowling green. A survey of the plant ( + bee & spider) life in Perivale West Meadows. The Greenford to Gurnell Greenway is a project to transform underused and disconnected green space along the river Brent in West London connecting Greenford town centre to Gurnell Leisure centre. It is one of six initiatives to improve green spaces as part of the London National Park City project. Greenford to Gurnell Greenway Project. As part of the Greenford to Gurnell (swimming pool) project, a new Perivale Park woodland is to be planted running alongside a recently constructed path. You can vote for the trees and make other suggestions here or view the location and design. There will be a community planting on Sunday December 2nd. Nicky Hopkins Memorial Bench in Perivale Park: the unveiling. The opening of the Nicky Hopkins memorial bench took place in Perivale Park at noon today. Here are a few photos of the occasion (click on any image for higher resolution).